Our Father’s plan for our happiness and our salvation is shared by our missionaries throughout the world. Not all who hear this divine message accept and embrace it. However, men and women everywhere, just like my young friend at the New York World’s Fair, recognize its truths, and they plant their feet on the path that will lead them safely home. Their lives are forever changed. Faith comes to the humble, the diligent, the enduring. It comes to those who pay the price of faithfulness. This truth is illustrated in the experience of two young missionaries serving in Europe, in an area where there were few convert baptisms. I suppose it would have been understandable for them to think that what they did wouldn’t make much of a difference. But these two missionaries had faith, and they were committed. They had the attitude that if no one listened to their message, it would not be because they had not given their best effort. 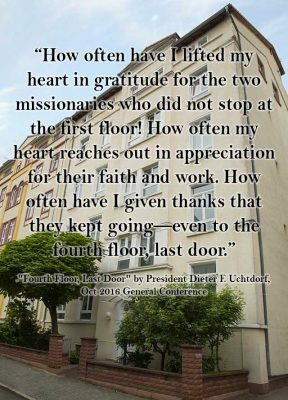 But these two missionaries had faith and they were willing to work, and so they knocked on every door on the second floor. Again, no one would listen. The third floor was the same. And so was the fourth—that is, until they knocked on the last door of the fourth floor. When that door opened, a young girl smiled at them and asked them to wait while she spoke with her mother. Her mother was only 36 years old, had recently lost her husband, and was in no mood to talk with Mormon missionaries. So she told her daughter to send them away. But the daughter pleaded with her. These young men were so nice, she said. And it would take only a few minutes. So, reluctantly, the mother agreed. The missionaries delivered their message and handed a book to the mother to read—the Book of Mormon. That young deacon’s name was Dieter Uchtdorf. And the charming young woman—the one who had pleaded with her mother to listen to the missionaries—has the beautiful name of Harriet. She is loved by all who meet her as she accompanies me in my travels. She has blessed the lives of many people through her love for the gospel and her sparkling personality. She truly is the sunshine of my life. How often have I lifted my heart in gratitude for the two missionaries who did not stop at the first floor! How often my heart reaches out in appreciation for their faith and work. How often have I given thanks that they kept going—even to the fourth floor, last door. 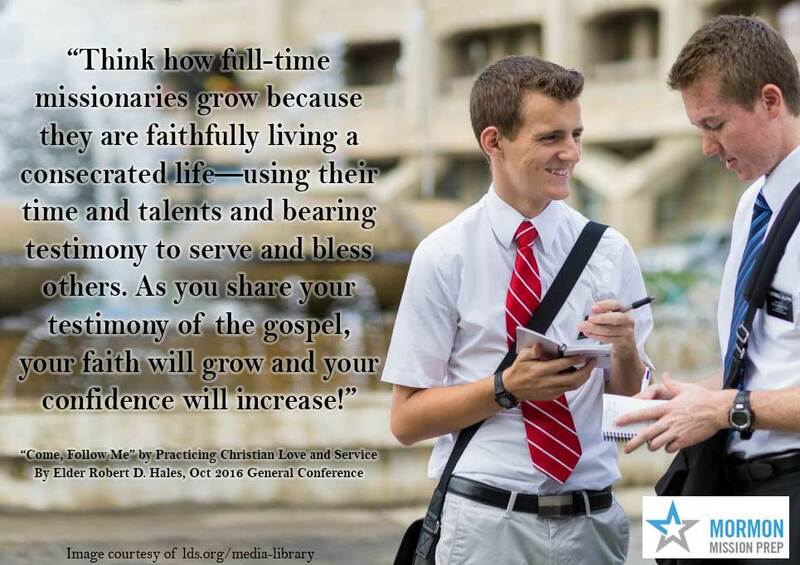 Youth, you are some of our most effective gospel teachers. You come to church to learn so that you can go home to teach and serve your family, neighbors, and friends. Don’t be afraid. Have faith to testify of what you know to be true. Think how full-time missionaries grow because they are faithfully living a consecrated life—using their time and talents and bearing testimony to serve and bless others. As you share your testimony of the gospel, your faith will grow and your confidence will increase! Be open about your faith in Christ. When the occasion presents itself, speak of His life, His teachings, and His incomparable gift to all mankind. Share His powerful truths from the Book of Mormon. He has given us this promise: “Whosoever … shall confess me before men, him will I confess … before my Father … in heaven.”10 I promise you that as you pray often and sincerely for opportunities to “stand as a witness of God,” those opportunities will come, and those who seek more light and knowledge will be put before you. As you respond to spiritual promptings, the Holy Ghost will carry your words to the heart of another, and one day the Savior will confess you before His Father. The spiritual work of helping someone come into the kingdom of God is a group effort. 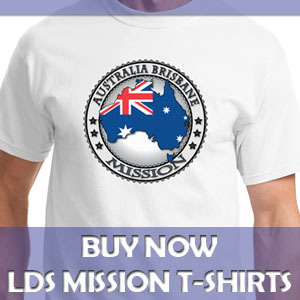 Enlist the missionaries as soon as you can, and pray for heavenly help. But remember, the timing of another’s conversion is not fully up to you. Kamla Persand was from the Mauritius island, attending medical school in Bordeaux, France, when we met her in February of 1991. We had prayed as a family to be able to share the gospel with someone who was seeking the truth, and we taught her in our home. I was privileged to perform her baptism, but we were not the most significant influences in Kamla joining the Church. Friends, missionaries, and even family members had been “witnesses of God” in her home country, and one day in France, when the time was right for Kamla, she made the decision to be baptized. Now, 25 years later, the blessings of that decision are all around her, and her son is a missionary in Madagascar. What does it mean to “be ambitious for Christ”? Being ambitious for Christ means being motivated, focused, and dedicated to His work. Being ambitious for Christ will seldom mean that we are singled out for public honor. Being ambitious for Christ means that we serve faithfully and diligently in our wards and branches without complaint and with joyful hearts. Our missionaries serving throughout the world are beautiful examples of those who are truly ambitious for Christ. …I am proud not only of Elder Cowan but also of all the missionaries throughout the world who serve willingly without murmuring or complaining. Thank you, elders and sisters, for your faith, your focus, and your strong ambition for Christ. 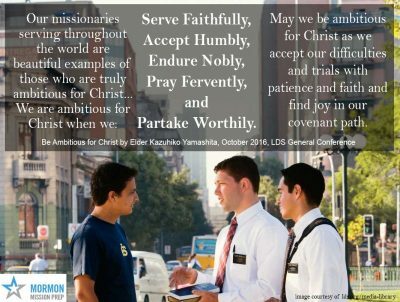 …My dear brothers and sisters, we are ambitious for Christ when we serve faithfully, accept humbly, endure nobly, pray fervently, and partake worthily. May we be ambitious for Christ as we accept our difficulties and trials with patience and faith and find joy in our covenant path. …Today we have many resources to share the gospel that were not available in earlier generations. We have TV, the internet, and social media channels. We have many valuable messages to introduce the restored gospel. We have the prominence of the Church in many nations. We have a greatly increased number of missionaries. But are we using all these resources to maximum effect? I believe most of us would say no. We desire to be more effective in fulfilling our divinely appointed responsibility to proclaim the restored gospel in all the world. …Sharing the gospel is not a burden but a joy. What we call “member missionary work” is not a program but an attitude of love and outreach to help those around us. It is also an opportunity to witness how we feel about the restored gospel of our Savior. That is why our missionaries leave their homes to preach His gospel. Their goal is not to increase the number of Church members. Rather, our missionaries teach and baptize to bring joy to the people of the world! When I served with my husband as he presided over a mission, we went to the airport to pick up a large group of missionaries one morning. One particular young man caught our eye. He seemed sad, weighed down, almost distraught. We watched him carefully that afternoon. By evening, this young man made a belated confession, and his leaders determined that he needed to return home. Although we were very sad that he had been dishonest and had not repented before coming on his mission, on the way to the airport we sincerely and lovingly praised him for having the courage to come forward, and we pledged to stay in close contact with him. This great young man was blessed to have wonderful parents, great priesthood leaders, and a supportive, loving ward. After a year of working hard to fully repent and partake of the Savior’s Atonement, he was able to return to our mission. It is difficult for me to describe the feelings of joy we felt as we picked up this young man from the airport. He was full of the Spirit, happy, confident before the Lord, and anxious to fulfill a faithful mission. He became an outstanding missionary, and later my husband and I had the privilege of attending his temple sealing. By contrast, I’m aware of another missionary who, knowing her unconfessed sin from before her mission would surely cause her to be sent home early, made her own plan to work extra hard during her mission and confess to the mission president just days before completing her mission. She lacked godly sorrow and tried to circumvent the plan that our loving Savior has offered each one of us. 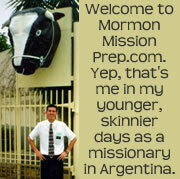 During our mission, I once accompanied my husband when he went to interview a man for baptism. 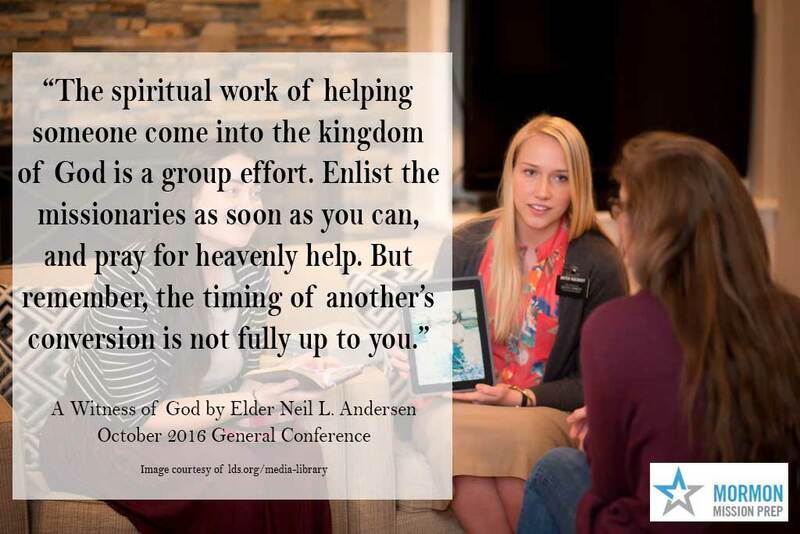 While my husband conducted the interview, I waited outside with the sister missionaries who had taught this man. When the interview was finished, my husband informed the missionaries that the man would be able to be baptized. This dear man wept and wept as he explained that he had been certain that the serious sins he had committed in his life would prevent him from being able to be baptized. I have seldom witnessed the joy and happiness of someone coming out of the darkness and into the light equal to what I witnessed that day.